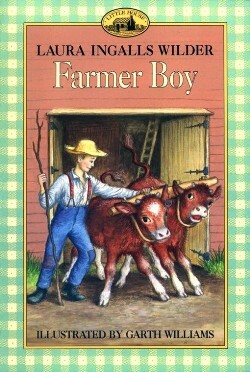 This thread is for the discussion of "Farmer Boy". I love reading about Almanzo's childhood! I felt so bad for him at the one point in the story where his potato that he was roasting explodes and hit him in the face (or something like that), the writing was so real I could see a little boy being upset and it made me sad to read about it. I also loved how Eliza Jane actually helped him when he stained the wall when their parents were away. I love Farmer Boy. I can read it over and over. I just finished reading this book last night... there is something I´ve wondered about through the whole book. I´m quite sure that in real life Almanzo had an older sister named Laura but she isn´t mentioned in this book. Does anyone know how come she was left out?? It was the first "Little House Book" I read, and hooked me for ever! I love the way Laura depicts Almanzo's meals. The guy loved to eat! OH MY GOSH YES!!!! Almanzo could EAT!!!! I read exactly the same in one of William T. Anderson's booklets...But I can't remember which one. I think it was in a juvenile Laura's biography he wrote. I wonder, too, if some of it has to do with, wasn't Laura already married and gone when the book was told? Maybe they were sticking with the kids that were in the house. Of course, when they have the family over, surely she was included in that. the children would have a hard time keeping everyone strait? It's been awhile since I've read this book, but I do remember there being a lot of details about the meals. Maybe they picked up that detail for the TV show, they portrayed him as loving to eat on the show as well! LOL. But I loved this book; I liked reading about Almanzo and his growing up. When ever I would read this one out loud to my boys, they would all get so hungry! So would I! I read all the little House books every year to my one son left at home- at his request! Dean Butler is visiting the Wilder Farm in Malone today to celebrate Almanzo's 150th birthday. He is making a documentary about Almanzo's life before Laura and is doing filming at the farm and surrounding area this weekend. The documentary will be available for purchase soon at the Malone site. Oh! That will be great! These are GREAT god news! Dean Butler is an amazing guy. Here is an article of the events so far at the Wilder homesite. Feb. 13, 1857, and died at age 92. He married Laura Ingalls on Aug. 25, 1885. Association bash at the Wilder Family homestead in Burke. 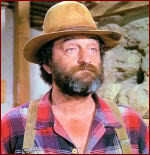 He played Almanzo Wilder for five years on the “Little House” series. question or posed for a candid photo. waited in line, hoping for an autograph. only, and even that was difficult. the “My First ‘Little House’ Book” series. Her appearance has been planned for about a year. even know where I’m going to be a year from now,’” Wheeler said. mom, Ellie, waited to approach. played Almanzo’s older sister, Eliza Jane. aunt’s house three or four years ago. I always felt sorry for Almanzo that his father wouldn't let him work with the colts. Then at the end of the book Almanzo is allowed to have a colt and the book ends! I was so disappointed! I really like how much work that Almanzo has to do. It makes me wish that kids today had a lot to do as well as I really think that it's good for kids to have work to do, though not quite as much work as Almanzo had! The part where Almanzo gets made at Eliza Jane cracks me up every time. It's such a typical boy! Eliza Jane was hurrying and nagging. "Be careful you don't spill the polish," she said, busily dusting. Almanzo guessed he knew enough not to spill stove polish. But he didn't say anything. "Use less water, Almanzo. And, mercy! rub harder than that!" He didn't say anything. Eliza Jane went into the parlor to dust it. She called: "Almanzo, that stove done now?" Almanzo muttered, "Whose boss are you"
Eliza Jane asked, "What's that you say?" Elize Jane came to the door. "You did so say something." Almanzo straightened up and shouted, "I say, WHOSE BOSS ARE YOU?" I think my favorite chapters in the book are when the kids are keeping house. When I would read Farmer Boy aloud to my boys, they would get so hungry! I just had to make pie for them! Ha-ha! My little boy's favorite chapter is Keeping house, also. Micah didn't have much opportunity for sibling rivalry since his brothers were/are more like uncles to him. He thinks it would be fun to have some brothers and sisters to fight with! I loved how Almanzo KNEW he wanted to be a farmer and he grew up to such a great horseman. Yeah, I would like there to be more books about him, too. Reading more about his move out to the Dakotas, his impressions of Laura, etc. would be lots of fun!